Austria, hardly recovered from the defeats which she had suffered in 1805, profited from the absence of Napoleon, occupied with the invasion of Spain, by making preparations for war. In spite of renewed assurances of peace by the ambassador of Austria in Paris, Napoleon had been gathering, since the month of March, the Army of the Rhine under the orders of Davout. It was this that, by its position, had to oppose the advances of the enemy. He gave the order to the Marshal to march from Saxony towards Franconia, and to fix his headquarters at Wurzburg. At the same time, he prescribed the gathering, at Ansbach, of the battalions and companies which were to form the reserve division under the command of General of Division Demont, the 4th battalion of the 21st, under Major Peugnet, arrived in this town on 4th April to become an integral part of this newly-created division. The Army of the Rhine was next directed into the Upper Palatinate and its divisions were distributed between Bamberg, Nuremberg, and Regensberg (Ratisbon), in order to face the Austrian troops in Bohemia. The Emperor then organised all his troops into three army corps of 50,000 men each. Davout had the command of the 3rd Corps and kept his three old divisions, those of Morand, Friant and Gudin, as well as the cuirassiers of Saint-Sulpice, a division of light cavalry, and a fourth division under the command of General Demont, formed from the fourth battalions of the army corps. On 7th April, Gudin’s division was in cantonments on the road from Bamberg to Nuremberg, between Kratshoff and Bamberg, and started on the 8th for the town of Nuremberg, where it was quartered on the 9th, part in the town, and part in the outskirts. On the l0th it arrived at Neumark. That same day the Austrians crossed the Inn, near Braunau, moving towards the country between Donauworth and Regensberg. On the 15th Gudin’s division arrived at Regensberg and joined the army corps. Napoleon, having arrived on the 17th at Donauworth to take command of the army, immediately gave the order to Davout to evacuate Regensberg, leaving the 65th Line there to form a garrison, and to march up the Danube to join him at Abach and Ober-Saal, in the vicinity of Abensberg. Gudin’s division passed from the left bank to the right bank of the Danube on 18th April, and on 19th, the corps marched in four columns on Abensberg. The 3rd division marched by Burg-Weinting, Wolkering, Saalhaupt, and Ober-Feking, to reach the heights which separate the Gross-Laber from the Danube and thus arrived opposite Abensberg. This flank march, which Davout made to join up with the Bavarians, on the Abens, caused some skirmishing with the enemy. Gudin’s division, which formed the head of the left-hand column, found itself, on descending the reverse slopes of the heights, in contact with the Austrian jaegers of Prince von Rosemberg. They disputed the village of Schneidort, but conceded it to the Austrians, and Gudin’s division bivouacked the same evening with Friant’s division between Unter and Ober-Feking. On the 20th April, Napoleon took the divisions of Morand and Gudin and placed them temporarily under the command of Marshal Lannes; he himself marched at the head of the Bavarians and the Wurttemberg troops against the Archduke Ludwig. Gudin’s division, together with Friant’s division, took the road from Rohr by Reising and Buchhofen, crossing a country covered with trees and cut by numerous defiles. The two divisions marched against generals Thierry and Schusteck at the village of Rohr, and forced them to retire on Rottemberg. They arrived in sight of this town at dusk. Meanwhile the Bavarians and Wurttembergers had forced the Archduke Ludwig to retreat to Pfaffenhausen. 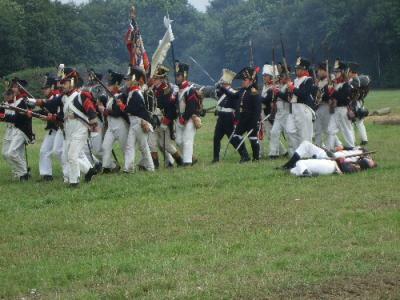 This day, the 20th, which Napoleon called the Battle of Abensberg had obliged the enemy to recross the Isar at Landshut. The town was taken on the 21st, and the Austrians took refuge on the Inn. While Napoleon triumphed at Abensberg and Landshut, Prince Charles rallied to himself the corps of Bohemia and forced the regiment isolated in Regensberg to surrender. Napoleon, to avenge the brave men of the 65th, ordered Marshal Lannes to leave Landshut on the 21st, with the divisions of Gudin and Morand, and the corps of the Duc de Rivoli, the cuirassier divisions and the Wurttemberg division. Gudin’s division marched eight leagues before it debouched, by Buchhausen, from a chain of hills facing Eckmuhl. At 3 o’clock in the afternoon, it found itself in the second line supporting the Wurttembergers, who took the village of Lintach from the Austrians. It went next to line the Gros-Laber, facing Eckmuhl, its outposts placed between Zaitzhofen and Roking. After the castle of Eckmuhl had been taken by the Wurttembergers, Marshal Lannes led Gudin’s division onto the wooded heights of Roking it outflanked the left of the enemy and became masters of the heights defended by Biber’s brigade, which disputed the advance foot by foot. The 21st Line, found itself on the extreme right of the line of battle, had only a few companies engaged. The division. struggling next against the Austrian cavalry, finished by crowning the road from Regensberg, and was then able to debouch onto the plain, towards Gailsbach, and advanced towards Egglofsheim at 7 o’clock in the evening. At Egglofsheim took place the cavalry charges which put the Austrians to flight towards Kofering. Gudin’s division, worn out by fatigue, bivouacked behind Egglofsheim, and night having fallen, the combat was adjourned until the next day, in case the Archduke wished to stand in front of Regensberg. The Archduke had decided to cross the Danube, while the cavalry manoeuvred on the plain, on the right bank, to protect the passage. The French, having set out early on the 23rd, arrived at the river just as the last Austrian battalions were crossing it. Nevertheless, our troops had not arrived at the river without striking a blow and in the different attacks that they had to sustain from the cavalry the 21st suffered particularly. Arriving before Regensberg, Napoleon had all his artillery placed in line to bombard the walls of the city while Marshal Lannes advanced with Gudin’s division towards the Straubing gate. There the skirmishers of the 21st had to suffer from the fire of the Austrians, placed on the ramparts. The Regiment entered the town, after the 85th Line, the enemy, pressed on all sides was obliged to capitulate. The 21st, which had been seriously engaged in this attack on Regensberg, counted among its dead lieutenants Paslom, Richard, and Evrard. Captain Honte, lieutenants Constant and Ladrague, sous-lieutenant Camaret, adjutants Bergeret and Aubry, sergeant-major Monin, and sergeant Souchon were among the wounded. On 24th April, Davout, who had just received the title of Prince of Eckmuhl, as a reward for the bravery which he had shown on the field of battle, received the order to follow the enemy on his retreat into Bohemia, thus protecting the march of the other army corps, which were advancing on Vienna, following the banks of the Danube. Napoleon returned to the Marshal the brave divisions of Gudin and Morand, which he had temporarily borrowed from him for the affair of Abensberg, St-Hilaire’s division was separated from the 3rd Corps, which thus found itself composed of its three old divisions . Used to serving with Marshal Davout since the camp of Boulogne, and having remained outside France since that time, the divisions of Morand, Friant, and Gudin were the perfect model of veteran infantry. The 3rd Corps, having left Regensberg on the 24th followed the Archduke to Nittenau, and drove back his rearguard as far as Cham. When the Archduke resolved, on the 28th, to definitely withdraw into Bohemia, Davout turned back, to return to Regensberg, passed over the Danube there, marched down the right bank of the river, proceeded via Passau and arrived at Linz on 4th May. On the 9th Gudin’s division was concentrated at Saint-Polten, covering on the Danube side the left flank of the army which was advancing on Vienna. On the 12th after a bombardment of 36 hours, the capital of Austria opened its gates to the French army. The 3rd Corps arrived there on the 20th, Gudin’s division stayed behind, the 85th had been sent on the 19th to Maria-Zell, and the three other regiments had left Saint-Polten the same day for Liegartzkirchen, on the 20th they were at Nusdorf, between Klosterneuburg and Vienna. From this point, which is on the right bank of the Danube, they could watch the whole river bank as far as Vienna. The Austrian army was in a line behind Gerarsdorf. On the 21st the right of the French army was resting on Essling, the left on Aspern, and, on the 22nd, Napoleon gained the famous victory of Essling. Davout’s corps was advancing to take part in the battle when the bridge which joined Lobau Island to a smaller island was carried away by an unexpected rise in the Danube. Halted on the right bank, he couldn’t arrive in time to lend a hand to Marshal Lannes. On the 23rd the Emperor had the army recross, part to the right bank, part onto Lobau Island, the 21st and 12th stayed in their positions of the previous day, at Ebersdorf. The division left this village on the 25th for Vienna. On the 31st it left with its artillery to go to Pressberg, where it had to take the bridgehead which the Austrians had built there in front of the town and on the right bank of the Danube. On the morning of 3rd June Davout put himself at the head of Gudin’s division and the village of Engerauwas attacked by the 12th, 21st, and 85th Line regiments, together with a Hesse-Darmstadt brigade. General Petit quickly took the village with the 12th Line and the Hessian skirmishers, however, when Davout wanted to push his advantage further he was stopped by a branch of the Danube, which served as a ditch to the works, and by the fire from the neighbouring islands. At this time the bridgehead lacked palisades, but, was armed with 12 pieces of artillery. The brave soldiers of the 12th and 21st rushed forward all the same to cross the arm of the river and force the enemy trenches, the intrepid General Petit, however, marching at the head of the voltigeurs of the 12th, found a glorious death, worthy of his life. In this action Adjutant-Major Geoffroy was killed, sous-lieutenant Rossy and sergeant-major Jobert were wounded. Some days afterwards sergeant Poliot, of the 21st. volunteered to set fire to the bridge of boats across the Danube behind the bridgehead, and succeeded in this operation, which had been attempted twice before but had failed on each occasion. Gudin’s division passed the whole month of June before Pressberg. working at the construction of entrenchments around the village of Kittsee. Davout observing that the Austrians were fortifying the town, declared that he would throw in bombs if they did-not stop their work. The Austrians not having agreed to stop, Davout had thrown into the place some 4,000 bombs and shells, which set fire to several quarters. This attack on Pressberg had the aim of attracting the attention of the Austrians to this point, while the army was preparing to cross the Danube below Vienna. On the 29th June Davout ordered General Gudin to have made a reconnaissance of the island of Obern which appeared to him to be strongly occupied by the enemy. The colonel of the 21st, charged with the operation, called for officers n.c.o.s and men to volunteer to cross the arm of the Danube, which formed the island in front of Pressberg where the Austrians were entrenched. Lieutenant Constant presented himself first, with two other officers and 150 soldiers. He received command of the detachment, which crossed the arm of the Danube on the 30th, one hour before daybreak, in little skiffs, under the fire of some cannon, and in spite of a lively fusillade from the enemy. The boat containing Lieutenant Constant and seven soldiers of the regiment sank to the bottom. Constant threw himself into the water and swam to the island, where the enemy were positioned; he attacked as soon as he had collected a hundred men on the bank. On his side, sous-lieutenant Jobert, having led 40 swimmers, had penetrated into the island. Two pieces of artillery and their caisson, 217 prisoners, 50 Austrians dead, not including a great number of wounded, were the result of this valorous attack. The 2lst had seven men killed and forty wounded, most of these had been under the fire from the enemy entrenchments forming the bridgehead on the island. Several of the brave men of this expedition were rewarded by the Emperor; lieutenant Constant received the Cross of an Officer of the Legion of Honour, and sous-lieutenant Jobert was named as a Knight of the Legion of Honour. During the night of the lst-2nd July the Regiment worked at the construction of batteries emplaced close to the enemy-occupied redoubt, on the island which they had captured the day before. Their work was hindered by a continual and well-directed fire. Early in the morning, the outposts and workers were relieved by Baraguey d’Hillier’s division, Gudin’s division set off early on the 3rd, to advance to Schwadorff, on the road to Vienna. On 4th July, at 4 o’clock in the morning, the division reached Schweckat; the 12th and 2lst entered Ebersdorff at 5 o’clock. During the night of 4th-5th the division followed the movement of the 3rd Corps, which, having crossed the Danube, placed itself on Lobau Island, facing the White House, the divisions in serried columns, filling the interval between the corps of Oudinot and Massena, which were respectively on the right and on the left. On the 5th, at 6 o’clock in the morning, the 3rd Corps had crossed the bridges and established itself on the left bank of the Danube. In order to advance onto the plain of Wagram, Napoleon had formed the army in two lines Davout’s Corps, marching in the first line on the right, attacked and captured the village of Rutzendorff. At 6 o’clock in the evening, the army faced along its whole length, the heights of Wagram. The 3rd Corps was established at Glinzendorff, facing Rossemberg’s Corps, it bivouacked around this village during the night of the 5th-6th, the night was cold in spite of the season, everyone lay in their greatcoats, and the soldiers, not being able to procure wood to make their soup, fed themselves on biscuit and spirits. At 4 o’clock in the morning the first shots from the cannon made themselves heard on the French right, it was Prince von Rosemberg, commanding the Austrian 4th Corps, descending from the heights of Margrafenneusiedl and was advancing on Grosshofen and Glinzendorf. General Gudin sent the 12th and 21st to the defence of the village of Glinzendorf. The two regiments, formed in column, attacked the enemy with spirit and forced them to withdraw to the Rusbach. The Austrian skirmishers, covering the space between the two villages had also been repelled; Prince von Rosemberg resumed his position on the slopes of the Neusiedl. The four regiments next took up their positions to attack frontally the heights on the other side of the Rusbach. Formed in line on the right bank, between Neusiedl and Baumersdorf, they waited for the right moment to advance. As soon as the divisions of Friant and Morand had opened their attack on the left flank of the enemy, the division entered into action under the control of Marshal Davout. General Puthod having replaced General Demont in the command of the division formed from the fourth battalions, threw himself into Neusiedl, and forced the Austrians to retire to the heights behind the village. At the same instant Gudin’s Division, which had just crossed the Rusbach, assaulted, under a murderous fire, the plateau of Neusiedl. General Friant, who had won ground in the rear of Rosemberg, forced the enemy to withdraw, and permitted Gudin to pass the square tower. The Prince von Hohenzollern, however, who was beyond Baumersdorf, facing Oudinot, who had not moved, advanced half of his troops towards the square-tower, and directed them onto the right of the division, in order to push them into the Rusbach. The cuirassiers attempted to charge, but were repelled in disorder. The 85th Line, of the 2nd Brigade, was welcomed with a violent fusillade, and stopped in its advance. The 12th, 21st, and 25th came to its aid, and the entire division engaged in a desperate struggle against the troops of Hohenzollern, who gave way little by little. The divisions of Friant and Morand, winning ground at the rear of the plateau, pursued the troops of Rosemberg. At this moment Oudinot threw himself on Baumersdorf, and the divisions of the 3rd Corps, forming an oblique line, arrived on the plateau of Wagram. Gudin’s Division, which had just covered itself with glory by taking by assault the village of Neusiedl, pursued, with the 3rd Corps, its victorious march onto the position of Wagram, while the two other corps attacked it frontally. Before this double movement the Archduke Charles ordered the retreat, and the left wing of his army took the route to Brunn, by the side of Wolkersdorf. It was 3 o’clock in the afternoon, the battle was won. The losses of the Austrians were immense the French took several thousand prisoners and captured some flags, and thirty pieces of artillery. General Gudin was wounded. The 21st suffered severely; lieutenant-colonel Ducrest was wounded in the shoulder, the Emperor named him, six days afterwards, as colonel of the regiment, to replace colonel Decouz, named as General of Brigade. The other wounded of the 21st were: chef de bataillon Francois, captain Monthoil, who had a leg amputated on the field of battle, captain Gaillard, who died of his wounds, lieutenants Nicolain, Caillebotte, Constant, Tyssautier, Leroux, Dauteuille, who died of his wounds, Menetrier, commanding the company of artillery, Bochet, killed, and Canat, sous-ljeutenants Dole, Delga, killed, Jobert, Durieux, Wertz, Aubry, who had a leg carried off by a ball, adjutant Arnoux, sergeant-majors Senechal, Perseille, Chaboisseau, Hemard, corporals Demouton, Aubry, Motte, Gasson and Baise, soldier Michaux and many others. Sergeant-major Senechal was cited in the Marshal’s report, as was grenadier Fayette, having, at Wagram, surprised 80 Austrians behind a barn, and made them prisoner. The grenadier was decorated for this exploit, and Senechal named as a sous-lieutenant. Sergeant of voltigeurs Boutloup, accompanied by two corporals, took, in a natural redoubt, a gun, and made 19 prisoners, including two officers, who they conducted to General Gudin. The 3rd Corps passed the night of the 6th-7th July at Gross-Engersdorf, with the exception of Gudin’s division, which was at Deutsch-Wagram and only rejoined the Corps during the 7th. On the 8th, the three divisions took position at Wolkersdorf, the Emperor, however, gave the order to Davout to advance further and the same evening they were at Wittfelsdorf, near Nicolsberg. On the next day, the 9th, they marched on Znaim to support the Duke of Ragusa, but they arrived too late to take part in the combat which took place near that town, and following which an armistice was concluded between the two Emperors, on the 12th July. The 3rd Corps entered cantonments in the region of Brunn, the time was used to instruct the troops and to reorganise the Corps. The three battalions of the 21st were cantoned during the months of July and August around Pohrlitz. All the soldiers of Puthod’s Division were assigned to the regiments of the 3rd Corps, and those of the 4th battalion of the 21st were divided between the three senior battalions of the regiment, and the cadre of this battalion was sent to Julich, where the depot remained, to gather there conscripts already formed, and return afterwards to take rank in the active battalions. At the same time two companies of the 9th Provisional Demi-Brigade were en-route to Vienna, and were to help fill the gaps produced in the Regiment by the losses in the campaign. General Puthod finding himself without a command, the Emperor put him, provisionally, at the head of the 3rd Division, as a replacement for General Gudin, who had been wounded at Wagramand was in Vienna. In the month of September the Regiment, which until then had been cantoned, moved into the barracks at Neunowitz. It had an effective strength of 3.320 men, divided into three battalions, under the orders of commanders Camusat, Broussard and Metreau. After the peace, which was signed on the 14th October, Davout received the order to take the Corps from Brunn to Vienna to form the rear-guard of the army. He had to, however, up to the last moment of the evacuation, remain in the positions which he was to take up beyond the Inn. The three battalions of the Regiment were cantoned in November at Zwerbach, Mank, and Kinberg. On the 15th December, the Regiment, under the orders of General Brigade Boyer set off for the Salzberg region, at the same time as the rest of the troops of the division.